A few notes on this table: I’m only interested in new money for the purposes of this article, so Trout’s deal is recorded as starting in 2021, leaving his 2019 and 2020 salaries entirely alone; he would have gotten those anyway. I’ve also excluded any team and vesting options in the “New Guarantee” column because, well, they’re not guaranteed (I have included any buyout in the contract value columns, because that money is guaranteed). I’ve also included players’ age and service time at the beginning of the 2019 season, as well as the earnings they had received or were guaranteed prior to signing extensions, because I think all three factors are relevant to understanding why these particular players might have been open to extensions. The table is sortable, so you can play around with it as you would like, but I’ll admit that I find it difficult to draw any general conclusions by examining each deal in its particulars. It does seem to be true, broadly speaking, that the deals involving several free agent seasons have been signed mostly by established players (Trout, Arenado, Hicks, Bogaerts, and Goldschmidt) while those deals locking in cost certainty for years already under team control are mostly the province of younger, less-experienced players (Bote, Jiménez, Acuña, Albies, etc.). The young stars who already got paid during the draft, meanwhile (think Kris Bryant and Carlos Correa) are largely absent (Bregman excepted). They, for the most part, don’t need what’s being sold right now. It is possible to look at each individual extension signed in the past six weeks and find nothing there of great concern — to find, in fact, a number of personal circumstances that militate in favor of one deal or another, from the perspective of a particular player and his idiosyncratic preferences. It is only when the deals are viewed in the collective, when we choose to view owners and players as classes attempting to exercise power upon each other, that the degree to which the modern labor environment has narrowed choices for players becomes visible. Free agency — the crowning and bitterly contested victory of the first generation of MLBPA members and leaders — is now perceived by many of those who won it as an exercise in humiliation. “Craig Kimbrel is one of the best closers in the history of the game,” one player grumbled to me last week, “and he still doesn’t have a deal [in the middle of April]. It’s ridiculous. Why would I want to put myself and my family through that when the time comes?” Manny Machado and Bryce Harper got paid this offseason, yes, but only after most of the league’s franchises had convincingly demonstrated that they were unwilling to compete for the two men’s services. Players got the message loud and clear. One interpretation of this set of facts might be to suggest that our present position — in which powers collectively won are only being effectively exercised by highly specific tranches of the player population — is the consequence of the market “sorting itself out,” literally assigning to different groups of players different prerogatives and different rewards that result from one choice or another. But baseball is not a free market. Baseball is a group of 30 owners in constant, though only occasionally explicit, contention with the union labor that is its raison d’etre. That means that insights from economics, with its neat lines of preference and consequence, can tell us only so much about the state of the game today. We must turn as well to political science, which is the study of power and how it’s used. A labor environment that is the product of power relations between two parties naturally in contest with one another does not have a state of equilibrium from which we have somehow fallen and to which we can soon return with one technical adjustment or another. It only has two camps competing with one another over a given pool of resources, and being more or less effective in their exercise of power over the other in order to enable that competition. That makes it a normative, and not exclusively a positive (read: objective) exercise. Baseball’s owners have of late been remarkably effective in their exercise of power over the players with whom they are in contest, to the point that it is possible to point to a hundred individual deals made in those years and find few wanting in isolation and yet a union full of players who are convinced, and not without reason, that they are in the process of being hosed. Individual choices made among an array of options limited by an exercise of power against those individuals as a group are not particularly meaningful choices at all. The last year has brought with it an awakening of player consciousness to the narrowing of choices they face, a realization that something must be done, and an increasing willingness to do it. The question, of course, is what. Here, I think, there is room for optimism. There is no particular reason that players and owners should have to tear each other down in public quite so often as they have, even as they will always remain inevitably in conflict. There are ways that the two camps can collaborate to grow the game such that it generates more money for everyone, as we saw clearly after the agreement reached after 1994 strike set the table for an unprecedented period of revenue growth for baseball. Ads like “Let The Kids Play” are important because they build power for players and the league alike, and grow reserves of good will that can later be turned into money, which can thereafter be used to expand the circle of players receiving the lion’s share of dividends from the game’s windfalls, to players in their first six years of big-league time, perhaps, or even to those in the minor leagues. Whether or not the players are actually being hung out to dry right now, many of them think they are, and that perception may well lead to a period of labor unrest that shrinks the scope of the game’s cultural meaning in a way that we haven’t seen since ’94. I hope that doesn’t happen. And in the meantime, I hope that fans will continue to grow in their understanding that deals which look good, or at least reasonable, in isolation can begin to smell poorly in combination, and that just because a given deal is understandable does not make it justifiable, or something we should necessarily be happy about. In other, simpler, words: Can does not necessarily mean should. Thinking about the recent deals as a result of a competition of power, rather than the inevitable result of some market-clearing activity, opens the door to expressions of opinion on the balance of the power that results. We as fans of the game have the means, through our voices and our wallets, to express our opinions on the balance of power in major league baseball, and I can think of no particular reason we should want to shore up the position of owners as a class having considered that balance. Major league baseball — as opposed to baseball as an amateur game we play only for ourselves, or our friends — exists because of the cultural meaning we fans assign to it, and the money and attention we pay to effectuate that meaning. That makes us shared stakeholders in its future, perhaps not as entitled to a voice in its direction as the players who play it and the league that facilitates it, but entitled enough to an opinion nonetheless. What we say matters, and how we choose to react to the choices teams have made this offseason can and should affect the way the game moves forward. 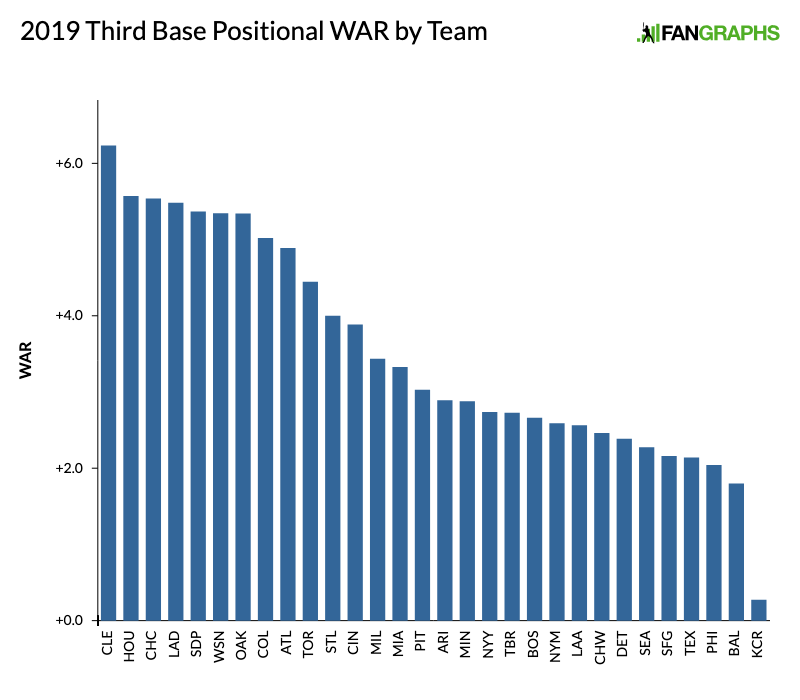 Through their first 701 plate appearances of the 2019 season, the Seattle Mariners hit 38 home runs and posted a wRC+ of 145. Both marks were the best in the game by a fair margin, though you probably knew or could have guessed that already, because Jay Jaffe wrote about the team’s strong offensive start on this site last week. What you might not know is that if you ask Seattle’s hitters about the source of their success, they’ll tell you — after getting through the usual platitudes of “just playing as a team” and “taking it one game at a time” — that this year’s daily hitters’ meetings, led by first-year hitting coach Tim Laker, have been good. Really good. Laker, 49, came up as a coach in the Diamondbacks’ system after spending parts of 11 seasons as a big-league catcher, mostly for Montreal. In Arizona, under the guidance of instructors Craig Wallenbrock and Robert Van Scoyoc, he developed an approach to hitting and communication that focuses on finding the intersection between a hitter’s natural strengths and a pitcher’s natural weaknesses, then communicating an approach based on the center of that Venn diagram that’s simple enough for hitters to take to the plate without needing a cue-card. Put that way, the system sounds almost too simple — bucketing continuous data into three or four tranches is not, after all, rocket science. But in the psychological world of hitting, simplicity is a virtue in its own right, and finding ways to communicate complicated data simply and actionably is where teams are currently looking to find any edge they can. In the Mariners’ case, the particular challenge they’re working to tackle this year is finding ways to get their players attacking each night’s particular starting pitcher while not getting too far out of their own comfort zone. That’s a tall order for hitters who have often been raised spend their days thinking of ways to keep their approaches consistent, not tailor them to each night’s starter. But Laker things he’s found an approach that works: translating the message into a specific external cue or physical action. The Mariners probably aren’t going to have the best offense in baseball all year long. They might not even have the best offense in baseball all April long. But if you’re chalking up their early-season numbers to mere good luck, or running into a stretch of pitching that’s performing below its level, I’m not sure you’re correct. Pitching has under-performed against Seattle for much of this young season (the just-concluded Astros series perhaps excepted) because the Mariners have been highly intentional about finding ways to make it so, and about communicating with their players in such a way that tailoring an approach to each night’s pitcher doesn’t feel like telling hitters to do things they’re not used to. So far in 2019, it may just be working. Update: Following Seager’s surgery, it appears that he will now miss 10-12 weeks, rather than the six weeks or so estimated at the time this article was written. Please update your misery accordingly. Last Friday, Kyle Seager dove for a ball that was smacked down the third-base line by the Cubs’ Javy Báez and hurt his hand in the process. Scott Servais removed Seager from the game during a subsequent pitching change, and the Mariners announced Monday that the third baseman would undergo immediate surgery to repair an extensor tendon in his left hand. I am not intimately familiar with extensor tendons as a matter of course, but I understand they’re what allow you to straighten your fingers and thumbs. Since you need to be able to do those things in order to play baseball, Seager will be out six weeks. Hunter Pence was born in Fort Worth, Texas, played high school ball for Arlington (manning shortstop his senior year), and then played college ball for Texarkana College in Texarkana and UT Arlington back home. Two years later, he hit .283/.357/.533 with 28 home runs and 95 RBIs for the Double-A Hooks in Corpus Christi in 2006, then .326/.387/.558 in a brief stop in Triple-A Round Rock to start off the 2007 campaign before finally making his debut for the Astros on April 28th. Friday, his decades-long quest to play at least one game for every amateur and professional team in the great state of Texas reached a new and likely final phase, as he signed a minor-league contract with the Texas Rangers worth $2 million if he makes the club. There was a time not too long ago when Pence couldn’t be had for a sum as small as $2 million, not even for a few months of play, but those days are well behind us now. Pence’s batting average, on-base percentage, slugging percentage, isolated power, BABIP, walk rate, and wOBA have each dropped in each of the last three seasons. Last year, he was worth -0.9 WAR for the Giants in his sixth full season for the team. That team, mired in fourth place and under new management, had no place in its outfield for Pence (the old guard did give him a custom scooter), and when it became obvious that the end of this five-year deal was the end of the road in San Francisco, it wasn’t clear whether the 35-year-old would play at all in 2019. He will, at least in springtime in Arizona, and that’s a small blessing to us all. Pence has always seemed like one of those guys who might have invented baseball accidentally had he been born into a world in which it did not exist. Ever-so-slightly bow-legged, tall, and lanky, he doesn’t look like someone who should be among the very best at what he chose to do, but he was for a time and maybe still can be in Texas. At the plate, he often coils backwards, hands hidden behind his torso, then unspools violently like a length of chain pulled suddenly taut. Eyes wide and utterly fixated on wherever the ball has gone, he is prone to regain his balance and, arms and legs flying, careen into first and beyond, if he can make it. Pence at his best is a joy to watch play the game. “Hunter helped lead the charge to our World Series in 2012,” former Giants’ GM Bobby Evans told me this week, “and his bat and leadership drove us to another World Series in 2014. He plays each game like it’s his last, and will forever be a fan favorite in San Francisco.” Well, he hasn’t played his last game yet: Pence says he’s changed his swing significantly this year, so maybe there’s a few more miles left in the tank. Texas doesn’t really need outfielders, what with Joey Gallo, Delino DeShields, Jr., and Nomar Mazara all already in the fold (and Willie Calhoun available in reserve besides), but they could use a strong bench bat or two and there’s no clubhouse in baseball that couldn’t use Hunter Pence. I’m never optimistic about players’ ability to re-tool their games after 35 — this is increasingly a young man’s sport, and there’s precious little margin to get it right — but in Pence’s case I hope I am wrong, and that Pence makes the roster and contributes for Texas this year. Hunter Pence is not like many we’ve seen before in this game, and we need more like him. He’s home in Texas now, ready for one more try. The Orioles signed 31-year-old Nate Karns to a one-year deal worth $800,000, with an additional $200,000 possible in incentives. Cleveland signed 32-year-old Alex Wilson to a minor league deal that could be worth $1.25 million in guaranteed money and an additional $750,000 in incentives should Wilson make the squad out of spring training. The Diamondbacks signed 36-year-old Ricky Nolasco and 33-year-old Marc Rzepczynski to minor league deals and invited both to join big league spring training. Rzepczynski’s deal could be worth $1.5 million guaranteed if he makes the team, with $500,000 in incentives besides. The terms of Nolasco’s deal have not yet been reported. Lastly, the Royals inked 33-year-old Homer Bailey to a minor-league deal with an invite to spring training; they did not disclose the terms of the deal. Bailey’s probably the best-known of the names on that list, but I also think he’s among the least likely to accomplish much in 2019. You may recall that, earlier this winter, Bailey played the part of “salary offset” in the deal that sent Matt Kemp, Yasiel Puig, and Alex Wood to Cincinnati. So underwhelming was his 2018 — in which he allowed 23 home runs in just over 106 innings pitched — that even the Dodgers’ brass, who stash spare pitchers in their overcoats when they’re just going around the corner for a gallon of milk, released Bailey immediately upon his arrival in Los Angeles. He was in blue and white for less than 20 minutes. In Kansas City, he’ll join Brad Keller and Jakob Junis in the Royals’ rotation and work to find a second wind. Nate Karns — another 30-something with success in his past and a terrible team in his present — has always been a little bit interesting for his ability to keep the ball on the ground with a four-pitch mix that features a two-seamer, a curveball, a change-up, and a heavy sinking fastball. The big question at the moment is how he’ll recover from the thoracic outlet surgery that ended his 2017 season near the end of May of that year, and kept him off the field for the entirety of 2018. Before the injury, Karns was carrying a terrific 50% groundball rate and 27% strikeout rate for the Royals — both improvements on his already-solid 2016 for the Mariners and in line with his 27 and 23% strikeout rates during his heyday with the Rays in 2014-15. Karns going to Baltimore, which is under new management, is probably good news for everybody involved. Karns, obviously, would like the opportunity to prove that he is healthy and can return to being the quality big-league starter he has already been at various points throughout his career. The Orioles would like that too — Karns has one year of arbitration left, and the Orioles will still need rotation help in 2020. Alternatively, depending on the state of the trade market next summer or the summer thereafter, Karns could be traded to a contender in exchange for some area of need for Baltimore. That, too, would presumably be welcome news for Karns. Pérez is a good pitcher and Cleveland needs a few of those. He had a terrific season in 2018 and there is reason to believe, despite his 16 seasons in the major leagues, that he has more left in the tank. He’ll be best served if the front office goes out and gets more arms to take some of the strain off of, say, him and Brad Hand, but if he pitches like he did last year, he’ll be useful anyway. Alex Wilson, apparently, is one of the arms destined to take the strain off of Óliver Pérez and Brad Hand. He was remarkably consistent for the Tigers during his last four years in Detroit, posting a 3.20 ERA and a 2.77 K/BB ratio over 264.2 innings pitched. Importantly, too, he’s demonstrated an ability to throw in different roles: over the course of his career, he’s pitched 50.1 innings in the sixth, 84.1 in the seventh, 97 in the 8th, and 54.1 in the ninth or later. The question, then, is whether the Tigers’ decision to non-tender him this winter was due to some concern about his future not visible to external observers or simply a consequence of the cost-cutting ethos that seems to have overtaken Detroit. I suspect it’s the latter, and like this pickup for Cleveland. As for Rzepczynski and Nolasco, it’s hard to get too worked up about those deals either way. The Diamondbacks’ bullpen wasn’t outright terrible last year, though it certainly had room for improvement with a 4.08 collective FIP, and Rzepczynski is second bit of the two-part bullpen improvement plan that started with Arizona signing Greg Holland. He got beat up pretty badly between Seattle, Cleveland, and Triple-A last year (an 8.25 ERA in 12 minor-league innings! ), so I’m not sure how well that’ll work out, but given his past success against lefties (he’s held them to a .227/.296/.305 career line), it’s worth a shot. Nolasco, too, had some good years for the Twins once upon a dream, but didn’t pitch in the majors last year and will struggle to win a rotation spot this year. These are the kinds of deals you make at the end of the winter, when spring seems close at hand and the snow just days away from melting.